Discussion in 'Wii U - Hacking & Backup Loaders' started by KeyPuncher, May 27, 2013. The goal of this program was to get full use out of the Wii U Pro controller's analog sticks. Note: I'm not planning on updating this beta program, instead I'm working on the final release and then will release the source code for Beta 7. Also, if the Toshiba Bluetooth stack starts to fail to keep the connection to the Wii U Pro Controller, sync it to a Wii U. It fixes the issue with saving profiles for Classic Controllers. Currently you need vJoy installed to make use of the virtual joystick functions, which will put Windows 7 into test mode since it has an unsigned driver. I will be looking for a replacement that makes setup easier. Non needed for the latest WiinUSoft w/ Hotfix and all future releases. I've been wanting to connect the Pro controller to the PC ever since I picked mine up when they came out but was unaware that it would only work with the Toshiba bluetooth stack. But with thanks to TeHaxor69's program I was made aware how to properly connect the controller to Windows and with some research, I was able to modify the WiimoteLib written by Brain Peek to add Wii U Pro controller connectivity. kazuna1, CyberMario, GilgameshArcher and 31 others like this. Is there any way you can make it so that the WiinUPro application can utilize something other than Toshiba Bluetooth Stack for the Wii U Pro Controller, or are we stuck with the damn thing? At the moment, it looks like we will be stuck with having to use the Toshiba Stack for the Pro controller and Wiimote with MotionPlus inside. I assume you've already tried adding your device to "tosrfusb.inf". It is possible to connect the Pro controller to the Microsoft Stack, but getting a stream from the device seems to not be possible. With 32Feet.Net the controller disconnects and with the WiimotLib it fails to stream. It's a shame really. I have not tried adding the adapter to tosrfusb.inf, as I have no idea how to actually do that properly (I know what and where the file is, but I just don't know how to actually add a new device into it without potentially screwing it up). Okay, I'll see if I can find you the exact instructions on how to do it. - at the very end of the document (about 582) add TosrfUsb.DeviceDesc153 = "[your dongle name here]" so you might put TosrfUsb.DeviceDesc153 = " Rocketfish Micro Bluetooth USB Adapter"
I also remember something about this step needing to be done while the drivers for the Toshiba stack are installing. You wait for it to create the file (I think when it asks you to insert your device), then you edit it with your info. That did it! Thank you very much for your help, and I'll be sure to give you feedback when you release a beta for this application! First Beta is up. There is a readme, but I will provide more details later in the week (and hopefully and update). does it work with x360ce? I have no gamepad to test it myself. I've got vJoy installed and my controller connected via the Toshiba bluetooth stack, but when I try to run WiinUPro I get an error saying "Error reading data from Wiimote...is it connected?" My bluetooth version is v8.00.03(T). I don't see anything faulty when looking through the device manager. I've got it mostly working, but it senses my left analog stick as going down-right all the time. @Speedster, did you try calibrating it in the Settings tab of vJoy's device in Joy.cpl? It showed that my left analog was frozen top-left at first, but it worked after calibration. I haven't noticed any other problems so far. I'm so glad the Wii U Pro Controller's analog sticks can now be recognized on PC. Thanks, got it working now! -Like Heimdallr mentioned, the D-Pad drops out sometimes (which gets really annoying sometimes). -Make it work as a 360 controller. Sonic Generations suffers from the infinite quick-step glitch without it. -Drop vJoy (like you've mentioned already). But even with the few issues, it's still really good for a first beta. Might just replace my 360 controller. Np, glad you got it worked out. About the Dpad issue, it seems to mess up if I hold multiple directions at the same time, like Left/Right + Up/Down. Basically it'll only detect one of the 4 primary directions at a time I think. 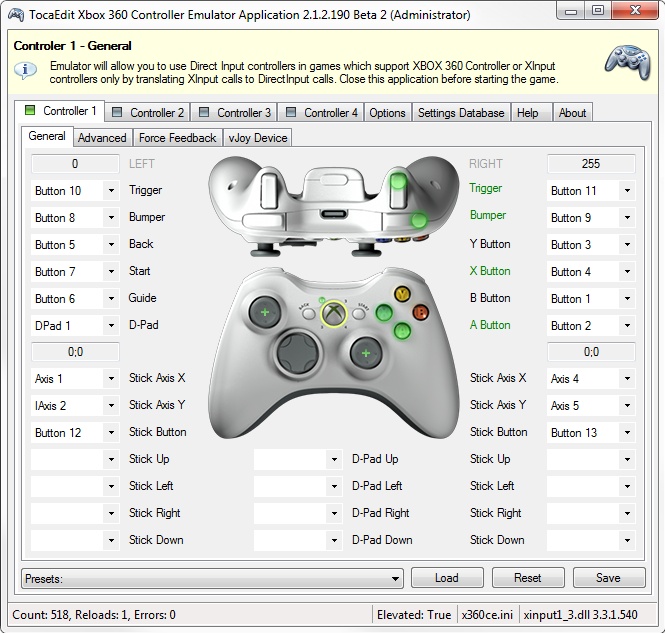 When using the 360 controller emulator? No, currently only works with one Wii U Pro Controller. Although their library will help with new features for the program. This should be fixed once I add support for multiple devices. I want this to be as stress free to use as possible. -When the D-pad input drops is it while you are still holding the direction on the D-pad or when you go to press it it doesn't do anything? -I had 360 controller emulation written down as one of the features I wanted to have but was unsure of it's possibility so I left it out so I wouldn't get anyone's hopes up. But with taking a quick look at x360ce again after gohan123 mentioned it, I think it will provide me with what I need to add it in. So I'll add that onto the planned feature list. Thanks for the feedback, I whipped the first beta up over the weekend so it's still quite rough and I can't wait to polish it! I read something about vJoy interfering with PPJoy on vJoy's forums. If I do end up using PPJoy then I will for sure post a video on how to fix this (assuming I find a fix). For the Dpad, I may just rethink about setting it a POV and go with just button emulation instead, that should provide better results. Also, Beta 1 is untested on a 32-bit operating system, so I am unsure if joystick inputs will work with it (seems unlikely since vJoy has separate libraries for x86 and x64), so if anyone tests it on a 32-bit OS let me know what happens. Thanks. Seems to happen at random, though it may be when I press 2 directions (haven't tested that). Just added the 2nd beta. New assignments have been added and the D-Pad is now mapped to joy buttons to avoid the issue of it cutting out using POV, this was because the POV could only be set to one direction at a time. Still uses vJoy for the time being and still can't save the custom mappings just yet, and you still cannot have other wiimotes connected or it produces a "Device not Ready" error. Saving you mappings and the error message should be in the next beta. Beta 2 link is giving me a 403 error for some reason. EDIT: D-Pad works like a charm. Connect Wii U Gamepad as a controller to PC without the Wii U client?